Both colors held in my usual hand. The green I knit just like I usually do, wrapping the yarn around my finger. 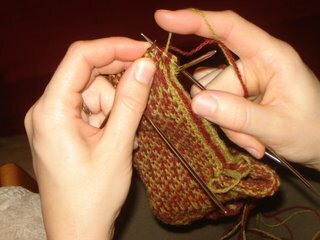 I had been knitting both colors that way, but that was what was slowing me down; the yarns kept sticking together and when I’d lift up the red the green would come right along with it (Shetland is sticky!). 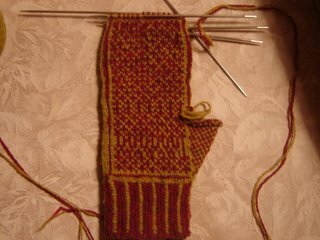 So I started just lifting the red up to knit wrather than wrapping it around. This eliminated the grabbing problem and it’s been pretty smooth sailing ever since. This being my first real fair isle project, there are of course, mistakes. I have one squished spiral. Also, yarn dominance came into play here. I had read before about how color will be more dominant than the other, depending on if you are carrying the color in the back or front. I switched halfway through. Can you tell where? Notice the red line going up along the thumb? See how thin it is and how it changes just past the thumb? That’s where I switched. To tell you the truth I had always thought, “Yarn dominance? Yeah, right.” I really didn’t think it would matter but I am amazed at the difference. Although, I still don’t get why carrying one strand in front or in back should make a difference, it just does. Anyone care to explain? I think you notice it even more on the palm. See how the bottom looks more green and the top more red? See the glaring pattern mistakes? I’m calling these my learning mittens. I’d like to do another pair in Koigu eventually. 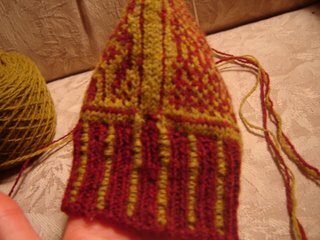 I love the colors but I’m not lovin’ the shetland. Here’s another weird thing I can’t figure out. 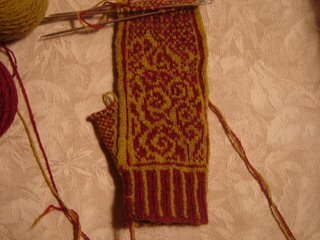 After the cuff, the first four rows of the colorwork is done in slip stitches, but it doesn’t seem to match up right and I’m thinking I goofed it up somehow, but I’m not sure how. If you’re making these, do yours look the same? Is that red line supposed to be connected all the way across? I wish I could get a closer shot. Well, I’m off to try to finish this one up, tonight maybe. I really need to keep my motivation going and get the second one done. 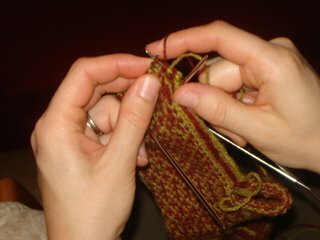 My eyes are starting to wander to some other yarn already, but I’m going to push through or else I’ll never get done. TV report: Little Man currently thinks the small TV is broken and it is going downstairs to the Skeptic’s shop for repairs. On the upstairs TV we unhooked the antaene completely so he gets nothing but fuzz. Amazingly, once he realized it didn’t work he barely mentioned watching all day. I think we’re just going to leave it unhooked for awhile to break him of the habit, then hopefully we can get back to our afternoon Mr. Rogers ritual. I like letting him watch then because I can get Knittybaby down for a nap and cooking shows are on afterwards, so there is no begging for more TV. It was interesting. He was very calm all day long. Those mitten look pretty good to me. You are my new hero for even attempting those mitts! those are seriously impressive!!! great work and how you took the pictures i’ll never know! The mittens are fantastic…what an ambitious project. I’m not one for chart-following colorwork, but you may have inspired me to give it a try! Thanks!!!! I believe yarn dominance works because the yarn that is going “over” is always behind the yarn going “under,” which pushes the “under” yarn forward slightly. Your mittens look beautiful so far! Remember that blocking is colorwork’s best friend; they’re great now, but they’ll be gorgeous when finished. Very, very nice job on the “learning” mitts!!! 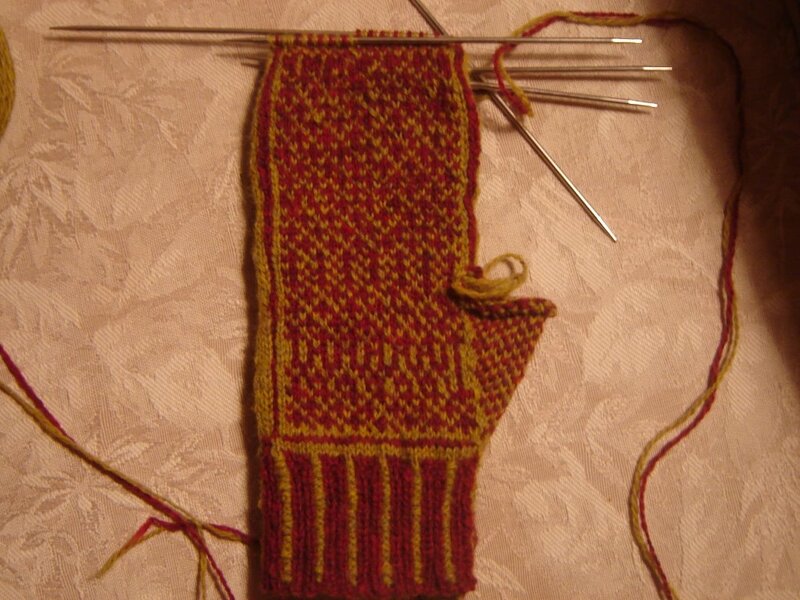 I’m most impressed since I’ve only attempted color work once and didn’t even finish it due to my frustration. I do loves my TV, but I see the effects it has on kids. I think it’s great that you’re working on breaking the habit early. Those mittens look good to me. I have never thought about yarn dominance. I don’t quite understand how to change which color is carried below. I love these mittens..you are doing a great job. I always struggle with carrying two colors and sounds like you have a real system. I need to practice.